Posted by Adam Adshead in Adam Adshead, Factory BJJ, T-shirts. To commemorate the inception of Factory BJJ on Saturday 1st March, we are pleased to announce the release of a limited edition t-shirt. In a stylish industrial ash grey, the front is adorned with the Factory BJJ logo and the back has a small message to mark the occasion. At just £10 each the short run of Small, Medium and Large shirts are available from Wednesday March 5th. Update: NOW Available – Hurry while stocks last. The only stipulation of purchasing a t-shirt is that you have to of actually trained at the Factory during the first month of us opening. 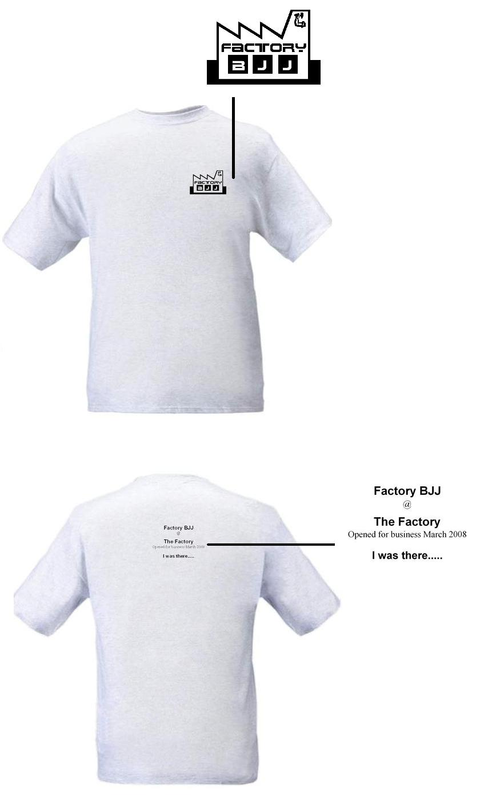 The idea is that people who actually own one of these t-shirts will always be part of the early history of Factory BJJ– Sorry. I will be designing an open market t-shirt and possibly rash guard in the near future which will be available to everyone, so if you’re interested please keep checking back.